2draw.net - boards - Contest! 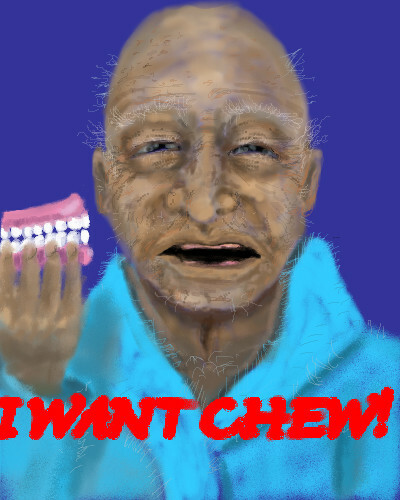 - I Want Chew!!! your faces are improving. Remember though, the hand is about as big as a face. Go ahead, test it...put your hand over your face. yea..I gave up on it.. I tried to do one two dozen times...its supposed to be sorta palm up..with the fingers up holding the denture...gave up tryin..
Don't get me wrong, it's not bad, I understood the position his hand is in, just too small. That's funny. :D This is classic davinci humor. lmao!!!! Best face you've ever done! Funny stuff! I Give It 8 TaC?s up!!!!! oh my gosh nice face poppa!! this is hysterical..leave it up to my dad to think of this cute idea! you da man, Daddy-O! Hehehe.. do you think I captured my likeness? lol good one, is it grandpa? what I like most about this is how fuzzy it is. It actually makes me want to go to sleep. TINA!! heheheeheh I just sent you a note look up at the very top right! Wow Davinci didn't know you did self portraites Just kidding heh.